Japan's mobile phone industry earned the nickname "Galapagos" - drawing parallels to the exotic animals that evolved on the isolated islands off South America owned by Ecuador; known for unusual animal life. In this Oct. 19, 2010 photo, Dadako Studio Japan President Hawken King, a 32-year-old Briton, shows an avatar application he developed for iPhone users at his office in Tokyo, Japan. 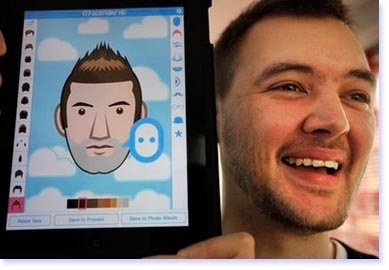 His 115 yen ($1.40) "Facemakr" allows people to easily and smoothly create avatars, or facial likenesses, on iPhone's touch panel, choosing images of noses, eyes and hairstyles. Why it is named so? quirky games and other applications that cater to finicky local tastes. Foreign developers of applications for phones didn't give the Japanese market a second thought because of its insularity. But that is changing as the iPhone, for which tens of thousands of applications have been created, dominates Japanese smartphone sales. Everywhere one turns, on commuter trains and urban cafes, people are tapping away at their iPhone screens in a relatively rare Japanese embrace of technology that isn't homegrown. American and other foreign developers for the iPhone now have eyes on this potentially lucrative market. And Japanese users, thanks to galakei culture that has long had services that charged small fees, such as "i-mode," are used to paying for their applications. Japanese developers, previously trapped into targeting galakei, in turn have a chance for a piece of the global iPhone pie, which topped 3 billion applications downloads globally in less than 18 months, according to Apple. Apple takes 30 percent of the application sales, but the rest goes to developers. Apple doesn't give iPhone sales breakdowns by country. But Japan makes up a significant chunk of the 70 million iPhones sold worldwide so far, including a record 14.1 million last quarter. The growing sales of smartphones running the Android operating system from Google Inc. are expected to expand the application business even further, from not just Softbank Corp., the only carrier to offer the iPhone, to giant rivals NTT DoCoMo and KDDI Corp.
Hawken King, a 32-year-old Briton, who founded a tiny venture in Tokyo called Dadako, which means "brat" in Japanese, is doing all right, selling his product to just 20,000 iPhone users around the world. About half of them are American, but third are Japanese. His 350 yen "Facemakr" allows people to easily and smoothly create avatars, or facial likenesses, on iPhone's touch panel, choosing images of noses, eyes and hairstyles. It costs $2.99 in the U.S. Developers like King say the success of the iPhone has evened out the playing field, allowing for a diverse range of products, rather than a winner-take-all or carrier-controlled market, which in the past favored established companies over newcomers.